language "PHP" and the database server "MySQL". of the directories and files is easier to understand. 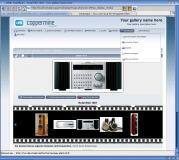 "phpMyAdmin" (http://www.phpmyadmin.net) or the picture database "Coppermine"
(http://coppermine-gallery.net) - just to mention a few. With the included interpreter for "PHP" you can also create your own tools. "PHP" is easy to understand and with it's extensions it is very powerful. it as a database backend. "AAMP:Common/share/man/man8" and can be viewed with "Next"
6 million installations. MySQL stands for "My Structured Query Language". MySQL is a project of the MySQL team at Sun Microsystems, Inc.
be viewed with "Next" (available on Aminet). version 3.01". See "LICENSE" in "AAMP:PHP". HTTP server and to launch and stop the server. and also the old version 1.3.33 available on OS4-depot. Written by Michael Christoph (http://www.meicky-soft.de). the system startup. So there is no need to launch them manually. the script "Stop_AAMP.bat" in "AAMP:". should stop the servers by launching the script "Stop_AAMP.bat". the address line of your webbrowser. The Apache HTTP server must be active. I suggest to use the OWB webbrowser. with the tool "Next" available on the Aminet. has a nice online help. Can be changed with "myApacheStarter". "skip_innodb" and save it again. After a relaunch of the server, the server automatically creates some files. is activated (See also section "Problems"). at the moment. This will hopefully be fixed in a next release. local web applications is no problem. request was processed. It should not cause serious problems. Doubleclick on the "Install" icon in the unpacked AAMP package. * http-handler from Chris Young. Offers the DOS drivers "HTTP:" and "HTTPS:". Both packages are provided in the "Contrib" drawer. ... Michael Christoph, who wrote the administration tool!